This speech was delivered on 17th of September 2005 at the URBS2 Symposium in Chioggia. This speech is in further editing process right now and I encourage you to put questions, criticism, suggestions on the Discussion page. It will be a contribution in the book on Urbs2 and I want to make it a standard reference to the Theory of GlobalVillages . Can the City Return to the Village? 4.4. Production: the "realisation workshop"
4.5. Education: "coaching rather than teaching"
There is remarkably little discussion yet about the deep influence that the recent events in New Orleans 2005 could have on the overall social fabric that underpins architecture and urban planning. Maybe an apt comparison would be with the earthquake in Lisbon of 1755. One might argue that although European philosophers had allready for 200 years laid the foundation of the age of enlightment, it took a massive disaster to shake old beliefs. One might equally argue that there is lots of justification to draw parallels to the currently dominating belief in market economy, which is "at the peak of its success". What we might learn in New Orleans and in other places of this planet is that the global pattern of human settlement is on one side linked to the causes of the coming decades of disaster of what I would call the global warming crisis; on the other side, this pattern is not only unable to help us out of the crisis, but even unable to protect us from the inevitable consequences of the lack of planetary management of the past decades. The core elements of this pattern have beed described by urbanists like Manuel Castells, Saskia Sassen and others as a selective geography of power and access. It produces what Mitchell Moss called the Dual City  with affluent and poor areas and is it in itself a very irrational and unsustainable construction. The double weight of urban overpopulation plus unsustainable, resource-devouring lifestyles of the rich in their suburbian districts create gigantic ecological footprints. The false security of being in the city has drastically manifested in New Orleans, where it was becoming evident what happens if urban support systems suddenly break down. Nevertheless the city seems to be the logical consequence of an economic pattern ruled by competition, the quest for higher productivity to outperform competitors and monetary growth. The pattern has the tendency to become stronger and stronger, it is simply self-rewarding to the point of ultimate catastrophy. No country or region in this world can escape the consequences of this self-rewarding process, because it has formed an alliance with Empire-building political force. Even if we can increasingly observe that the Emperor has no clothes, there seems to be a lack of alternative on a global scale and a kind of self- running logic that obsolesces past patterns of development. Even fundamentalists team up with this logic, and the urban development of Teheran or Riad is not substantially different from the schemes we see in the West - not talking about Shanghai or other cities in China where the economic logic is brought to its ultimate consequences. It is highly ironical that the ultimate argument for this historical development is the absence of an alternative. It is hard to find anybody of some professional knowledge to be in defence of the patterns sketched above, and there are hardly any justifications that the patterns we are confronted with are by any means reasonable (or sustainabe). But it seems that the whole world is in the ban of the four words or rather the four letters the iron lady used to drop when she was approached by criticism: "TINA - There is No Alternative". And even if Francis Fukuyama has found new labels for justification of capitalist cultural dominance, still there seems to be the "End of History" in the sense that we have no pattern (or sufficiently developed collection of patterns) that transcends the current status quo of design, despite the fact that everybody seems to know that the overall design is bad. We refuge into small scale, efficiency, formal revolutions or the breaking of all forms, spirituality, aesthetics like a drug that keeps the eye away from the destructive nature of the process as a whole. Architects are nowadays more or less trained to understand the need of their target groups, to not plan for a utopian circumstance, and I think this is right. In my years of encounter with architects I have seen the mental trap of utopian models that are not underpinned by a keen analysis of the socioeconomic framework on the base of which they can function. It is right that the beauty and the coherence of a vison can be very attractive, but this is certainly not enough to make it attractive and workeable. To give a brief account of myself, I am a sociologist by education, born 1954, and I dropped out of my studies because I felt that sociology as a discipline is crippled to the point of arrogance: giving arcane interpretations of obvious facts that the rest of the world simply does not care about, constructing models that are empty and bloodless. The sociological methods are literally equaly applicable to a game of soccer and to a religious ceremony - sociologists find their own categorial apparatus in each reality. This is a weird way of justifying and distancing from everything. Everything is somehow "functioning", based on communication, "interaction" or roles, and only the sociologist knows how tricky this is, to be a "system" with "elements" and "processes". The gain of his scientific activity is the elitist conscience that the world is far more complicated that common sense understands - and thats it. So I dropped out of my discipline and I was much more attracted by the upcoming information revolution where there was real change going on. Despite the things I said about utopia before, I was and I am shaped by the feeling of endless possible change as subtext of our era that many people might be familiar with - a feeling that made me lover of Science Fiction in my early days ("sense of wonder"). It was that feeling that I met again when I was starting with Computers in the mid eightees. I started to work as HyperCard supporter with Apple Computers, went to America and met Douglas Engelbart, who is one of the key people that started the computer revolution - because I felt this sense of wonder in reorganizing the way we may think. It is due to Douglas Engelbart that I could rediscover my role as a sociologist - by understanding it as a role of cocreating knowledge and innovation in a community with diverse perspectives. This brought me together with architects, and this also led to personal encounter with Paolo Soleri of Arcosanti, the visionary architect of utopian cities. Here I fould all the elements of daring dream, grandious vision - and still the shortcoming of the onesided architectural thinking that I mentioned before. I felt it is not enough to have one utopia, you got to have many - and integrate them where they can solve real problems. This is the way I also came finally to acknowledge Christopher Alexanders "pattern language" as a guiding style for my thinking. What motivated me from the beginning was the strange feeling to be torn apart between the urban and the rural. I grew up in Vienna but I had rural places in summer and winter that I considered like second homes. One of them was near Dubrovnik in Croatia, the other one in the mountains of Salzburg. When I was travelling to Greece, I decided that Greek villages (the mountain villages of Samos) were really beautiful environments to live - offering spaces for community with people and spaces to have community with nature. Then, in just 10 years, I could observe the immense decay of Samos villages inflicted by its opening as a tourist destination. At the same time, the media and computer revolution began to change our notions of time, space and society. The agreement with Mr. Engelbart was that such changes could be "engineered" by a coalition or better community of stakeholders - if they co-found intentional "bootstrap" communities of research and practise and decide to share their knowledge and act transdisciplinary. I had visions of future villages in my mind and I thought that images and imaginations play a crucial role in this process, but at the same time this villages must include a socioeconomic answer to the needs and aspirations of the young people that - what I also experienced - flock and flee to the cities because there is something that attracs them there. So the thing that I want to put in front of you today is the result of research based on my personal perspective and experience, even maybe, though I try to neutralize my point of view, on personal preferences and emotions. I have followed the idea of the village empowered by information technology since more that 15 years now, and the idea went through many stages of what I hope means maturing and becoming more concrete. We had field trials, international conferences, architectural competitions, large public exhbitions and formed networks and communities. Yet this community is at the very beginning of its work, and we need to merge, to grow, to conect. This conference is another opportunity for to do that and I want to issue an invitation, but this invitation is also linked with a serious challenge. It has to do with the decades of disasters that we are facing through the global warming crisis and with the necessity to change our current economic and political system to facilitate the point of planetary management and engineering. It is a challenge that includes many professions, and one of them is the architectural profession. This is the tiny representation of an image of the visionary "city with Zero footprint" of the Nox people in the Science Fiction series "Stargate" In this episode, the team of Stargate visits a planet which is inhabited by a seemingly primitive race of people living in small groups in the middle of the gigantic forest that seems to cover most of the landmass of the planet. But in the course of action the primitive race turns to have extraordinary abilities, including reanimation of deadly wounded persons and "other essential skills of saints". 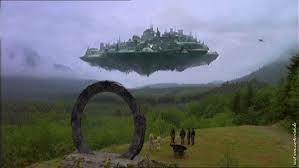 In a critical scene - when asked about how they can protect their race from the abnoxious Goa'uld - one elder of the group unveils to the earthlings the city that you see in the picture, floating in the sky, not leaving a footprint on the planets green surface. So their secret is having left behind technology but not in a negative sense of abandoning it completely; rather they decided to make it invisible and reduce its footprint on the planet. I think this picture is very powerful and telling; it is one of the most beautiful visions I have ever seen, giving us the hint for a long term solution to our deepest problems. In this seminar there was frequent mentioning of the mantra "WORLD=CITY" on the back side of one of Rem Kohlhaases books, and I think it is OK that architects open their eyes to the reality of urbanisation and not get trapped into false imaginations. At the same time I strongy oppose that concept. If world was only city it was a nightmare. A wonderful theme for science fiction dystopias, as shown in other speeches here, but not to far any more from our reality. We are experiencing dystopia. Cities are artificial realities created by human beings; the cityscape is made, is an arbitrary statement of human possibilities. We still know not all we need to know about ourselves, but I dare to say if a human being wants to discover his true self he or she needs to get out of the man-made reality and refuge to the natural. The city might tell us what is possible; but not what is appropriate. The Tower of Bable is the ultimate urban metaphor; a self containing reality that seems to follow the imperative to grow beyond any limit. So the myth of Bable is a powerful and eternal one, but we must now interpret it in a new way. Meditating on Bable, we find the surprising development that "men began to speak different languages and confusion rose among them" as the ultimate reason for its destruction. So the inherent danger of the city is that we loose our identity, our distinctiveness, our direction. The city absorbs the diversity of people, tradition, goals, it is a gigantic melting pot, a wonderful learning and communication facility, but it puts limits on the manifestation of human ways of life. We are forced to dress and undress in spectacles and cabarets, to constantly present ourselves in the eternal urban stage, but in this manifestation we are embedded into a certain code of politeness, of rules that allow everybody to be this own image and yet not to hurt or touch each other too deeply. The limits of space and time do not allow us to really dive into any one of the identities we come accross. And if we do, the city becomes the stage of culture clash. By all this I do not want to idealize the traditional image of the village. The human refuge, the mass desertation from rural areas is mirroring the poverty and limitation, in material and spiritual sense, of traditional village life. Only in a very few cultures in human history has rural life meant something else than considerable deprivation, danger and ignorance. Where a "culture of comfortable subsistence" has florished like for example in the short bloom of the Inka Empire in the Andes, it was based on communication and information, on large networks of protection and coherence. generally speaking, villages were often the preferred goals of predators, the object of dominance and opression in feudal systems, the unprotected victims of forces of nature and thus prone to fear and fate. At the same time, wave after wave emerges from urban environments to bring the meanwhile grown mind back home. The romantic rediscovery of nature was not just a fashion; it contained the clear notion that after all the human being is not complete where it is not rooted in the community of beings that make up Gaias skin, fragile and eternal at the same time. It is strange but true: in untouched nature or cultured landscape we usually experience a sense of "self-ness", of de-alienation, which helps us to feel more complete, "reload our batteries", be less prone to manipulation by cultural environments. Modern Tourism expresses this need, but in a destructive form; by the very way it is organized it makes us destroy what we were looking for. In this situation I want to suggest a possibility which emerges out of the technological progress of our time, suggest in the sense that I am pointing at real developments that prepare a new pattern of human settlements. The developments I am talking about are the two great movements or sets of ideas around ecology on one side and communication technology on the other side. The insights of ecology helped us to conceptualize human habitat as a catalizer for natures self- regereneration. If human and natural processes are looked at from a higher viewpoint of mutual regeneration, there is a vast new world of opportunities to create interplays between them. Ecosystems and biotopes are not given, unchangeable realities in which the human being has no place; they are by themselves dynamic equilibrums, open systems of self-optimisation through complex interplay of living elements. They can be object of careful studies, adaption, design, architecture; human life and habitat can be designed around the paradigm of the plant, optimally in tune with its immediate surrounding if it happens to be put at the right place and designed with a spirit of tensegrity, a word coined by Buckminster Fuller meaning the integration of flexibility and integrity. The development of information and communication technology, on the other side, could enable naturally "embedded" small scale human settlements to offer virtually all of the services and amenities of cities while still allowing us to feel the rural quality of life and care for healing and human dimension. It is important to understand that in this concepts those villages need NOT become new cities, in fact their most precious wealth is that they are distinct from cities. In villages we can often find an intact eco-system, an aesthetic landscape, and a healthy environment. At least in some cultures, villages are probably the closest approximation of harmony between nature and humans. Is it possible to work with these environments and bootstrap them without destroying their character? This is the very core question of the GIVE (Globally Integrated Village Environment) project. Villages, as mentioned before, have a somehow bad connotation today. They are often synonymous with the feeling of backwardedness, ignorance, and mental stuffyness. They are often identified with agriculture as exclusive occupation of their dwellers. Villages are rarely the originators of new ideas or a centers of innovation, in contrast, they often resist the establishment of new patterns and procedures. In the last centuries up to today, persisting migration from rural areas occurred because villages could not secure an income and decent life for their inhabitants. It seems that only the cities could offer to the human being the freedom to lead a life according to one's demands and visions. Even in the remotest areas, people have a theoretical chance to find a relation with supporting and nourishing networks, getting even close to the centers of business and commerce - if broadband infrastructure exists. There were some attempts in the eighties and nineties to establish telecottages and similar institutions, and some of them are still doing quite well. But only today we are at the brink of satisfactory technology development and we also have the content base and availability. Things like Google or ebay would have been unthinkable utopias in the eighties. Having every document on the web indexed and retrieving it in a split second is more spectacular than anybody in these days would have thought of. However, at the same moment new problems has appeared . The globalization of business triggers competition of an unseen scale. Thus, "rivaling with everybody everywhere" automatically implies that only the "best" (fastest, crudest) succeed and the rest fails. And cities are much better suited for this economic competition. This competition is requiring absurd amounts of energy while delivering lesser and lesser beneficial results. What once was a promising opportunity for everybodies economic development, to export goods and take part in global exchange, has nowadays become a nightmarish constraint which devoures the mind and the resources of whole nations. Global capital has become increasingly demanding on infrastructure, qualification and costs of production, so the financial resources for "unproductive" activities like health care, social work and services, art, but also and in particular the protection and maintainance of our cultural landscapes and historical heritage are in jeopardy. The quite different events of 2005 in New Orleans and Paris have indeed demonstrated the rottenness and degree of neglectivenmess of the social and infrastructural fabric in those societies which are even supposed to be the winner countries of globalisation. The effects of the unsustainable global patterns of production- consumption triggered by the competition-growth-speed imperative even threat the planetary climate system and still produce an enormous overpopulations of "paupers" in the less favored areas of our cities. A double crisis meets the ignorance of politicians who have no choice but ignore and belittle the results of what they are enacting. Consequently, the less lucky have only one chance to survive: if they learn to use local resources to * actively disjoin * their workplace from global competition and rather build up local cycles of efficient mutual cooperation in a self-organized way. Here the economic imperative meets with the ecological one. What further strengthens this perspective is the fact that there is not only a vast movement of likeminded locations and communities on the horizon, but also completely new tools like the internet and decentralized automation so - instead of being commodified and sold - knowledge can be universally shared and put into action and effect everywhere. So while the official reading of things goes like "Capital cannot employ people any more", one could say the associated work and intelligence of humans has no need for the command of capital nor the concentration of workforce in the factory any more! A potential network of decentralized human activities sharing the worlds resources and participating in shared ingenuity is already proving real, be it in Free Software or in Knowledge repositories like Wikipedia. It could expand to a new renaiscance of local food production and fabrication, based on exchange of knowledge and algotithms driving flexibly automated tools. At the same time, also the political and social fabric of industrial age hierarchy is changing rapidly. Spontaneous self-organisation with serious and professional consequences has proven succesful in governance, development work, health care and other fields. Non- governmental organisations are filling the void that the decline of public activities has left. So why should these Free Modes not work in all domains of human activities? Or at least: why should we not try to build an additional structure of living around them? Global Villages are at the centerpoint of this sustainable alternative to subdueing all life to competitiveness, as they allow people in a location with available natural resources to make a living out of technologically supported sustainable cycles of matter and energy - and become more autonomous and independent. "Global Villages" are opposed to "globalized villages"!! If they succeed in building up these cycles, if at the same time every actor in the village builds on the strengths of global informational cooperation and all those communities build on their accumulated power of knowledge production, they might end up providing similar services and comforts like large cities with less stress. As it is true on one side that these changes might offer the chance for a more independent life, however, they also require from local communities to assume more self-responsibility. In such a decentralized system, a relatively small number of specialized networks - perhaps structurally integrated multinational companies, in some instances states or international organizations - might provide and sustain the basic infrastructure, like transportation ways, communication lines, and basic services. The local actors , on the other side, will be much more responsible for the structure of their lives and their immediate organization, including social issues. In the emerging social structure of global villages different social groups and people with different abilities and desires must therefore thrive to live in intentional symbiosis. While one group provides an income through telework and global services, others secure supply and satisfy local needs - and they are themselves connected to sources of global cooperation that allow them to perform better. In the context of a village, both groups should see and understand their immediate interdependence and mutual advantage. That is the base of its success! The specific aim of the GIVE project is to draw look at the influence and the potential of new communication technologies to constitute new patternsof resilient and satisfactory human habitat. Such new models of human habitat - no matter if we call them "fractal city” or "televillage” or "ecocommunity” or something else - should be able to provide solutions to more human needs by local resources. Thus they help to do away with the burden that the separation of production and consumption has put on society. The most important feature of such a living environment is the possibility to lower the pressure that marketisation has created on peoples life and refocus on sophisticated and consensual activities directed directly towards quality of life, health, wellbeing and development of human knowledge. On the other side, some participation in global economic processes is also necessary to create monetary income for the community and individuals. Such schemes could be telework, tourism, healing, specialties etc. They would be means to an end, not the ultimate purpose of such communities. In this context, both social and spatial architecture of society need to undergo drastic changes to benefit rather than suffer from the effects of new technologies. The GIVE project is studying the interdependencies of various building blocks of this new human habitat. This new habitat can be described as a "pedestrian-oriented, clustered and diverse communal microcosm of limited size, usually embedded in a rural/natural environment. Teleworking is therefore seen as a catalyst for development of local exchange, production and cultivation, which might take the form of "high-tech-self-providing” (Bergman) rather than production for anonymous markets. In the seven years of GIVEs theoretical development, more and more importance was given to the place which provides what in this context was called the "virtual urbanity”. The existence of such a "global place” is actually at the core of many successful examples of sustainable regional development, even if not explicitly conceptualised. By no means is the design of such a place or structure a trivial matter: it is at the same time the place where a community finds its identity - often by presenting itself to the outside world -, and the place where inputs and impacts from outside flow into the community. Comparing to merely market & technology-driven concepts like telecenters, much more promising conditions to have such a global place have rather shown up in the transformation of educational institutions. The sharp distinction between workplace, educational place and place of social gathering disappears, in fact each of these functions is increasingly connected to the others and their interplay and combination in spatial and organisational terms might soon become an essential part of succesful regional "development”. The concept of the global place is therefore relevant for either side: work, education and social cohesion. At the 1994 ideas competition for the establishment of a business resort near Palma de Mallorca known as the Parc BIT, the team of the British architect Sir Richard Rogers proposed a revolutionary settlement type. The idea was to combine an urban "Microkernel", a microcosm supplied with dense housing, offices and telematic infrastructures in the center, with a rural surface of gardens, farms, single family homes, open space. The dissipative surface of the urban microsystem would take care of many material needs of the system. One could say that three traditionally separated settlement patterns (the urban, the suburban and the rural) are combined in close diameter. In Rogers design, the urban plaza at the centre is surrounded by buildings with two of three floors, while at the outside the buildings might be only one floor high. This contains an allusion to "urban hills" models which favor density and treedimensionality to multiply the efficiency of a community. Alexander gives various points to support his notion that decentralisation of government and the establishing of regions is a necessary step in achieving a sustainable world. The first point is that in a country of larger dimensions central governments have the spontaneus tendency to supress local development and local needs. The second point, that there would be an overseable council in a world federation that is built on direct representation, maybe not of great importance here. The third point is that regions should also be considered "bioregions" in coherence with their ecological system and therefore human management. The fourth point is that this is the way to preserve cultural diversity. "The regions of the earth must .. keep their distance and their dignity in order to survive as cultures"
I would add some more points. In the time of global communication, a region of this size (about the size of Austria or Switzerland) would contain the sufficient digestion-capacity to keep up with global levels of science and technology and to transform their meaningful and important results into action and consideration throughout a given regional culture. Then again, as Alexander argues, the region is big enough to host a mosaic of subcultures. In our vision of "global villages", there is a strong tendency to form subcultures and local identities. If the regions were to small, this "urban effect" of diversity within a region would be disturbing. If we acknowledge the leverage potentials of proximity and synergy of processes in terms of the reduction of energy use, waste of time and material, transportation and human stress, we must also acknowledge that the discovery and the realisations of these potentials is much more knowledge-intensive than traditional linear-production. The work of forerunners like John Todds "Living Machines” has shown that in order to generate a really functioning cycle of resource renewal, we need to increase the number of involved processes. The construction of "Living Systems” leads to increasing complexity on one side, which begets miniaturisation on the other side (Paolo Soleri). The increasing role of automatisation in the shaping of human environments does not simply reduce the need for human work, but transforms it into integration work. The conditions of every process in short, middle and long terms have to be overviewed. While the number of processes increases in arithmetic scale, the interdependencies between these processes grow in geometric scale. The maintenance of a knowledge base necessary to manage this increased material complexity exceeds by far the capacities of any local or regional educational system. Therefore they need to tie into networked fields of support. This may also lead to a changing role of the industrial megacenters of today. Large cities might turn into support hubs for not only their regional environment, but for special types of knowledge needed worldwide. See below: mothercity pattern, material production. Work, education and social cohesion used to be separated domains of human lives, organized in distinctive life periods and in separate institutional and spatial settings. With the advent of the information society and information-based economies, the sharp distinction between workplace, educational place and place of social gathering disappears, in fact each of these functions is increasingly connected to the others and their interplay and combination in spatial and organisational terms might soon become an essential part of succesful regional development. It is one good thing to have Internet at home. But even those who do (and that is still widely a minority in rural areas of Europe) enjoy the synergies that can emerge when human encounter and internet access are merged.The interplay of two media can achieve results beyond the effects of each single one. In our context we constantly need to improve the equilibrum of a place in which people can just "drop in" and a place where there is a schedule or program set; a place which is privately owned and run and a place which fulfills community functions; a place which offers human support through information coaching and a place where people can be self-directed and self guided in their activities. We can find these places inside and outside the traditional educational institutions; in schools and in social organisations, regional development agencies and libraries, in telecenters and cultural houses. We can see that they offer leisure activities as well as learning activities, professional support as well as cultural and traditional functions. Internally, they might well be segmented: in sections that are more for public use and in sections that allow professional use on site. We might see them not only acting as distribution centers, but also as documentation centers, documenting local knowledge, accomodating information brokers, virtual librarians and other professions which go beyond information coaching; or we might see them as outlets, slim and efficient, which change their face like a chameleon to bring a broad range of services to a smaller location.Whatever the case may be, these places may be best built on a mix of public and business functions and thus being able to sustain themselves. Given that, we might see those places as "breeders" or "incubators" of global villages. One of the most exciting technological developments on the horizon is the linking of the computer to the physical world. What happens if the computers capacity to handle complex structures is connnected with the possibility to manipulate physical matter, so-to-say "atoms instead of just bits"? This is not just an academic question since the advent of Rapid Prototyping, technologies that are still expensive in the making but capable of incredible results. A device which is not much larger than a big computer printer of the early days creates physical objects out of raw materials. The ink jet of the printer replaced by a laser beam that for example is sintering metal powder particles to solid objects in three dimensions in considerable speed. These devices are called "fabricators" and do exist allready - and many serious voices are predicting nowadays that they will create the next industrial revolution, moving production away from large factory halls and back to the environments where the physical objects are actually needed. They would be capable of enormous flexibility, being able to create with highest precision and durability any material part needed for example in the repair of a car. So instead of relying on expensive transport and spare parts logistics, local fabrication would build out of vast electronic repositories any part needed. This way, we would undergo the same dramatic changes that we have observed in the printing industries: restructuring of production, dramatic losses of jobs in the industry, specialisation on high volume production while a lot of daily routines is done in a much more decentralized fashion by or near the "end users". In the context of "Global Villages", this would be another interesting pattern that supports the larger settlement pattern; "shared workshops" or specialized small businesses would be able to perform productive activities formerly only available to large industries. We do not know which socioeconomic forms that could bring about: maybe the predictions of the revival of craftsmanship and small enterprise (Christine Ax) or the rise of high tech community production (Frithjof Bergmann) are rather first hints than complete images of the future. They all build on the somehow blurry figure of the "prosumer" which was created by Alvyn Toffler in his book "The Third Wave" in 1980 and which lacks any socioeconomic concretisation. What is important here, is that for the first time in history factors that lead to the sharing of knowledge might oughtweigh the secrecy imperative so vital in the history of business and professionalism. Producers might join in vital agreements like Creative Commons or General Public License to actively create product part repositories which make it possible to share results between businesses. It might be more clever to give everything away and be sure to operate in compatible common standards than to try to maintain a proprietary universe expensive to create, adopt and maintain to the immense progress of science and technology. This imperative would be even reenforced when Microsoft-type corporations should try to use their monopolies on "intellectual properties" to collect extra profits from their ability to hinder productive activities throughout societies. What can be foreseen and is partly reality already, is the rebirth of "guilds" that share and defend common information as base of their productive abilities. We might suppose that a very strong and vital actor in Global Villages are local producers that rely on global repositories. We can well imagine that their tools are themselves produced by large corporations who might still hold trade secrets but at the same time foster their position in face of local communities by social contracts which guarantee free domains in knowledge and technology. But we might also foresee a great need in cocreation and codesign between those actors. The work that is on one side saved by the automation of production is put into design, standardisation and integration of processes, into ordering and documenting processes in repositories and so on. Maybe those virtual networks will one day outperform large corporations even in very complex tasks. That race looks like one that shoudl be started. The pattern of public internet access points includes a new professional understanding of education. Those places will not be effective if the human side is neglected. There are great self-learn tools on the internet, there is a host of support and guidance available, but all these carry with them the tendency to disrupt and devaluate personal encounters. One way to support growth of Global Villages is to have supportive intermediaries that can be called and considered Regional Information Coaches. These are not just experts in knowledge sources and the way to assess them; they also put learning processes in the framework of personal and group interactions, facilitating local partnerships of any kind, matching competence and innovation in an arena of shared resources and real abilities. We also need to see that the intended changes to work, we cannot rely on things to work automatically. The Global Villages transformation might be not only one of the biggest transformations in history, but also one of the most knowledge-intensive tasks. All of the things said so far require lots of information and consideration, and it is naive to believe that humans will be able to achieve those things without a dedicated support system. The availability of information on the internet is not saving us time, it is costing us a lot of time to filter, refine and make things useful - still all in all a gigantic net gain comparing to the megawasteful system of today. This time has to be invested by society, or the benefits that this model offers cannot be reaped. Maybe we will see a renaiscance of monastery-like institutions where global knowledge is "digested" for regional and local usage. Architects that work with Global village schemes will deal with a lot of social innovations! One of the more subtle social innovations is the de-standardisation of things. While Open Source Collaboration in material fields requires the standardisation of parts, procedures, building blocks, we might see an incredible diversity of "customisation" occuring to the final products. The best way to explain this tendency to mass-customisation is to point to modern urban culture. In my interpretation, events like the classic love parade are an opportunity for individuals to put creativity in action. But because the urban environment is so dense and alien to individual "shapeability", because it has to function for so many need at once, the urban creativity is using the body as a means of expression. This is the reason we see events where people are modifying and styling their bodies almost like decorative walls. For me, this is deceptive and degrading, in all its abundance it is a sign of the poverty which only leaves us "the smallest possible template to display to the largest possible number of people". The decoration of the body is not a means of sexual communication, it is a last resort of creativity in a world of invisible "no trespassing" - signs everywhere. The decoration of the home has lost its significance since the homes are no public places any more. Global Villages will serve as a projection pane for collective creativity, but also allowing for the interplay of individual and collective creativity. They will be different in their appearance completely coherent with the values that their inhabitants have chosen. A wise choice of values includes diversity, keeping in mind Arostotles saying that if people are too similar they cannot build a city; but this village-type city like many traditional neighborhoods in cities endulges in subculture-building, a pattern which also Christopher Alexander considered as a timeless value. "The bolos (aka villages) are not primarily ecological survival systems, for if you only want to survive it's hardly worth it. The bolos are a framework for the living-up of all kinds of life-styles, philosophies, traditions and passions. Bolo'bolo (the village system) is not a life-style in itself, but only a flexible system of limits (biological, technical, energetical, etc). As for the knowledge of such limits, ecological and alternativist materials can be quite helpful, but they should never serve to determine the content of the different life-styles. At the core of bolo'bolo there's 'nima' (cultural identity) and not survival. For this same reason, nima cannot be defined by bolo'bolo, it can only be lived practically. No particular 'alternativist' identity (health foods, earth shoes, woollen clothes, Mother Earth mythology, etc) is proposed. The crucial function of cultural identity is illustrated best by the fate of the colonised peoples. Their actual misery didn't start with material exploitation, but with the more or less planned destruction of their traditions and religions by the Christian missionaries. Even under present conditions many of these nations could be better off - but they just don't know any more why they should be, or what for. Demoralisation goes deeper than economic exploitation. ..
... In spite of some vulgar-Marxist conceptions, 'culture' is more important than 'material survival', and the hierarchy of basic or other needs is not as obvious as it might seem, but rather 'ethnocentric'. Food is not just calories, cooking styles are not luxuries, houses aren't just shelters, clothes are much more than body insulation. There's no reason why anybody should be puzzled if people who are about to starve struggle for their religion, their pride, their language and other 'superstructural fancies' before they demand a guaranteed minimum wage. Since the 1960s a period of cultural invention has begun in many - especially industrialised - countries. Having been disappointed by the material riches of the industrial societies, a lot of people have turned to cultural wealth. Where should the nima come from? It is certainly wrong to look for cultural identities exclusively in old ethnic traditions. The knowledge and rediscovery of such traditions is very useful and can be very inspiring, but a 'tradition' can also be born today. Why not invent new myths, languages, new forms of community life, of housing, clothing, etc? One person's traditions can become another's utopia. The invention of cultural identities has been commercialised and neutralised in the forms of fashion, cults, sects, 'waves' and styles. The spreading of cults shows that a lot of people feel the need for a life governed by a well-defined ideological background. The desire that is perverted in the cults is the one of unity of idea and life - a new 'totalitarianism' ('ora et labora'). If bolo'bolo is called a kind of pluralist 'totalitarianism', that's not a bad definition. It can be said that since the 1960s a period of cultural invention has begun in many - especially industrialised - countries: oriental, Egyptian, folk, magical, alchemical and other traditions have been revived. Experimentation with traditional and utopian life-styles has begun. Having been disappointed by the material riches of the industrial societies, a lot of people have turned to cultural wealth. Since the nima (cultural direction) is at the core of a bolo, there can't be any laws, rules or controls over it. For the same reasons, general regulation on work conditions inside the bolos is impossible. Regulated working time has always been the central show-piece of utopian planners. Thomas More in 1516 guarantees a six-hour day, Callenbach a 20-hour week, Andre Gorz ('Les chemins du Paradis - l'agonie du Capital', Galilee, 1983) proposes a 20,000 hour work life. After Marshall Sahlins' research on 'Stone Age Economics' (1972), the two or three hour day is about to win the race. The problem is, who should enforce this minimal working time, and why? Such regulations imply a central state or a similar organism for reward or punishment. It is important to keep in mind that the main distinction between "village" and "global village" is that the location is not the fate of people, it is a matter of choice. While the permanent restructuring of the "elastic cities" of today, resulting from the meteorological turbulances of the corporate and financial fever curves, is a degradation to the human need for stability, order and beauty, it also allows us to conceive a state of increased responsibility for the realities we create. Culture is, by the words of the "European Culture Union", "a mirror image of what society has decided on". Global Villages are a projection pane for such decisons and an experimental site alike; they allow us the full manifestation of the human adventure by living the consequences of our decisions, yet allowing us to correct mistakes at any stage and be creative again. Coming back to the image from Star Gate, I think it has become clear from the previous thoughts that GlobalVillages is not a project for the eradication of cities. Global Villages is in fact nothing else but a program to restore a healthy balance between cities and countryside, while giving new meaning also to cities. In the Global Villages concept, cities have an even more central role than ever before in human history. They become network centers, hubs, places who are significant in their field of excellence beyond their physical boundaries. The new role of cities is a positive extrapolation of the current transformation that drew cities into a global economic space and forced them to define their role in a global urban system of flows and logistics. More than ever before, cities compete with each other directly for influence and power in this global field. This powerful role of cities has the effect of a vacuum cleaner on peripheral and rural areas; cities are the great multipliers of productivity and speed in economy, they are increasingly outperforming the rest of the world in competitiveness. They are the refuge of economic opportunities that are dwindling elsewhere; and they are the catastrophic junkyard of overpopulation. They foster industrial agriculture, ruin prices, devour resources. The youth of the world is deserting to the cities in the name of future; and the experience is that there is no future for most of them, while the elders and weak cannot sustain the landscapes that once used to be sources of life. But the vacuum cleaner can change its direction; cities can engage in becoming Mothercities. The dominant urban reality will also inevitably shift power away from national states to urban agglomerations. The allusion to a shift from "Fatherland" to "Mothercity" is intended. "Mothercity" is a city that discovers that urban spirit is not necessarily confinded to geographical borders. Ultimately, I think this is one reason I have been invited to Chiogga, to this seminar on the "flexible city", to show you the paradox consequences of what we are going through today. Cities, if they really reflect deeply on their transformation, will discover that they have become place-transcending phenomena, cultural clusters. That is the point that leads us to the vision that intelligent cities of the 21st century will do everything they can to help that physically large parts of the population can return to the villages, but stay connected and embedded in urban mindsets. Thanks to Klaus Klever for the incentive.